Guest Post by Geoff Russell. Geoff is a mathematician and computer programmer and is a member of Animal Liberation SA. Late in 2006 the United Nations Food and Agriculture organisation published one of those huge thick reports that gets a one column story in quite a few newspapers and then vanishes from sight. It is Livestock’s Long Shadow (LLS). The report is a compendium of data and analysis on the impacts of the livestock industry on the earth’s eco-systems. There are major chapters on land degradation, air pollution, water pollution, biodiversity, with concluding chapters on policy options for reform and expansion. This is the first of a few posts which will review major parts of the report. I’m not aiming at an comprehensive review, but rather at presenting key pieces with other relevant information which should allow people to appreciate the linkages between the global systems of food, feed, livestock and their impact on climate change. Remember always that food is what people eat, and feed is what livestock eats. We will begin by looking at the first two LLS chapters which provide structural background for the remainder of the report. Keep in mind that LLS is written by people advocating an expansion of the livestock industry while I advocate a reduction. Hence my choice of the term factory farm instead of the more euphemistic intensive/landless used in LLS. Let’s start with a couple of tables which serve to give an overview of the structure of the global livestock system. These tables will also show that the Australian livestock industry is somewhat unusual. The first table is a who’s who of agricultural commodities. Most of us live in a single dwelling and buy major items of metal, wood or plastic infrequently, but we all eat everyday and the global ebb and flow of food largely determines our appropriation of the planet’s resources. Forestry, for example, causes just 3% of Amazon deforestation. In Australia, we have cleared 100 million hectares since white arrival, but forestry operates in just 13.3 million hectares, most of which are not cleared. We crop just 24 million hectares and urban areas occupy just 1.6 million. Here as elsewhere livestock is the primary driver of land clearing and biodiversity loss. The data I’ve assembled in this table is an amalgam of parts of LLS Table 2.9 with a little data from the FAO and the US Department of Agriculture on plant food and seafood. The palm oil/soy oil figure of 70 megatonnes comes from USDA. It is faily evenly split between the two oils. The fish-meal figure is from LLS but was checked against with the International Fishmeal and Fishoil association. They give a similar figure and the implication is that global fish-meal, created annually from 30-35 million tonnes of fish, is entirely consumed by livestock (including aquaculture). LLS explains that as aquaculture expands it requires fish-meal, because the fish of choice, like tuna and salmon are carnivorous and require fish in their diet. Despite what you may have heard, people don’t need to eat sea food of any kind. As aquaculture diverts fish-meal from livestock feed, this leaves a hole filled increasingly by soy. The top section of the table is meat production, the bottom is the major components global plant production, which is a combination of food and feed. We will see later just how much of this production is appropriated for feed. This is a complex and dense table and we will spend a little time highlighting things that an Australian might find surprising. It is customary to quote meat figures as carcase weights. But you only eat 60-75% of the carcase, so the edible meat will be somewhat lower than this table indicates. There are 4 kinds of production systems. The two in the middle are mixed systems. These are farms which grow some or all livestock feed for the animals they produce. This implies that some or all of the farm is suitable for crops — arable. A factory farm gets all its feed from somewhere else. So a factory farm competes with humans for the plant food products at the bottom of the table. Absent from the bottom of the table are fodder crops. These are important in many livestock systems. Australia, for example, has an area of irrigated hay and silage production about 50% bigger than our entire irrigated fruit growing areas. In 2005/6 we applied 770 giga litres of irrigation water to this area, which is about 100 giga litres more than we applied to fruit trees. Global fodder figures are missing from LLS but we will revisit the issue when we deal with Chapter 4 of LLS and water issues. In Australia about 2/3 of beef and half of our dairy products are exported. Ignoring that, beef and chicken consumption are similar with pork being about half the size. Globally on the other hand, pigs dominate the meat industry and chicken production is bigger than beef. In Australia, almost all pig and chicken meat is produced in factory farms. So the Australian meat production profile, with its beef dominance, is rather different from the global average. But since chicken and pig meat outsells beef locally, over half the meat consumed in Australia is produced in factory farms. Globally, factory farmed meat is just under half of all meat. The total global production of 241.5 million tonnes sounds like a lot of food. The UN Food and Agriculture Organisation also keeps accurate data on plant food production and contains what are called Food Balance Sheets on its statistical website. If you take the production figure, add the imports, subtract the exports and animal feed, you get the amount of each food left for people to eat. Divide this amount by the population and you get the calories per person per day. All up, animal food, which also includes fish, milk and cheese, provides 17% of the daily average of 2808 calories. If you think that protein would be a more flattering measure of the value of animal production then you would be right. But until very recently in human history, a diet with adequate calories provided adequate protein. These days, a diet of coke and fries can simultaneously make you obese and protein deficient. For more background on protein see the section below. 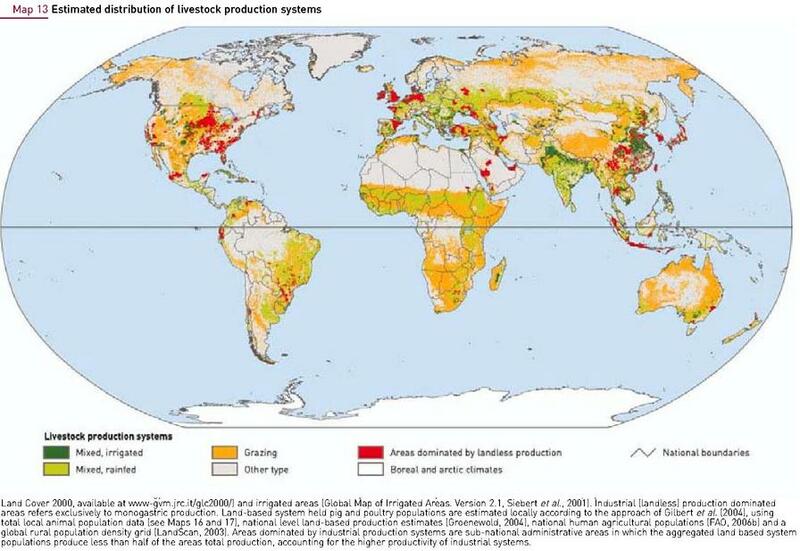 The LLS map on the left shows the distribution of livestock production systems which provide this 17% of global calories. Livestock graze 26% of the ice free surface of the planet, about 3.4 billion hectares (about 4.4 times the area of Australia). But we can see from the above table that this vast amount of grazing land produces a fairly small proportion of global meat. A grass fed cattle carcase in Australia or from the Brazilian Amazon comes in at 200-250~kg. But a grain fed feedlot animal produces a 350~kg carcase. In addition to pasture, livestock consumes the output of 471 million hectares of the crop land. This is about one third of all current crop land shown on the left. All up then, animal foods use 471 million hectares of crops + 3,400 million hectares of grazing + the entire and declining output of both fresh water and ocean fisheries but provide just 17% of global calories. Plant foods provide 83% of global calories from 940 million hectares of crops. Based on current cropping outputs, if people switched to totally plant based diets, we could return the full grazing area of 3,400 million hectares to other species, together with a significant proportion of the 471 million feed hectares. At the other extreme, if the entire 6.7 billion of the world’s population ate like the richest 1.4 billion, then massive increases in both grazing and cropping areas will be required. Now we are ready to look in a little more detail at the global feed consumption of livestock. So here it is, together with an added row giving the total biofuel use of grains in 2007. As you can see, the biofuel contribution to the current global food crisis is pretty much a straw on the back of a camel laid low by the burden of global meat production. The oilcakes row is interesting. Oilcakes are a byproduct of making oil from soybeans, peanuts or various other oil yielding plants. Oilcake is typically very high in protein and minerals. Overall, LLS estimates that 77 million tonnes of protein is fed to animals in food suitable for humans for an output of 58 million tonnes. Of course, when the global food crisis hit in early 2008, even Oxfam jumped on the blame-biofuel bandwagon while ignoring the industry which supplies the beloved Aussie BBQ. How much food do we use as feed in Australia? Here are stats from 2005/6. In the following year, 2006/7, because of ongoing drought in Australia, we imported about 2 million tonnes of feed grains. So, in a very real sense we helped to exacerbate the global food crisis in two ways. First with the import of grains, and second by the normal use of about 11 million tonnes annually to feed cattle, pigs and chickens. 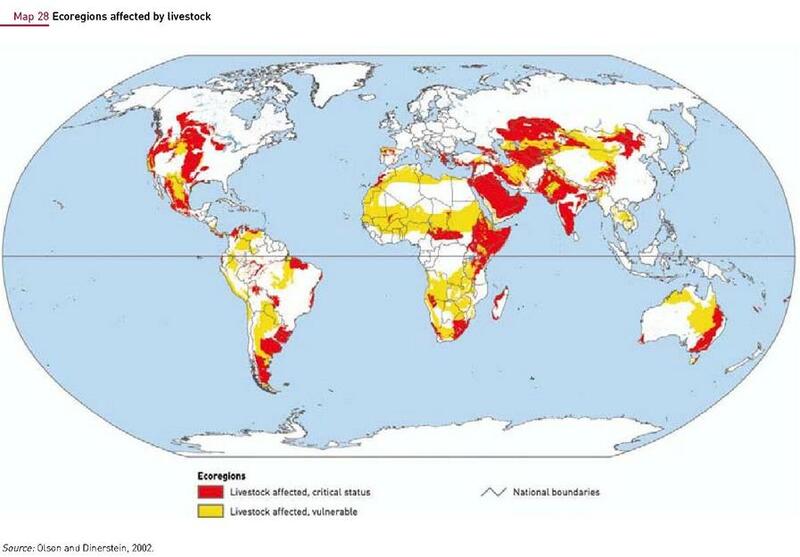 This map shows the global area regarded as either vulnerable (yellow) or critically affected (red) by livestock. 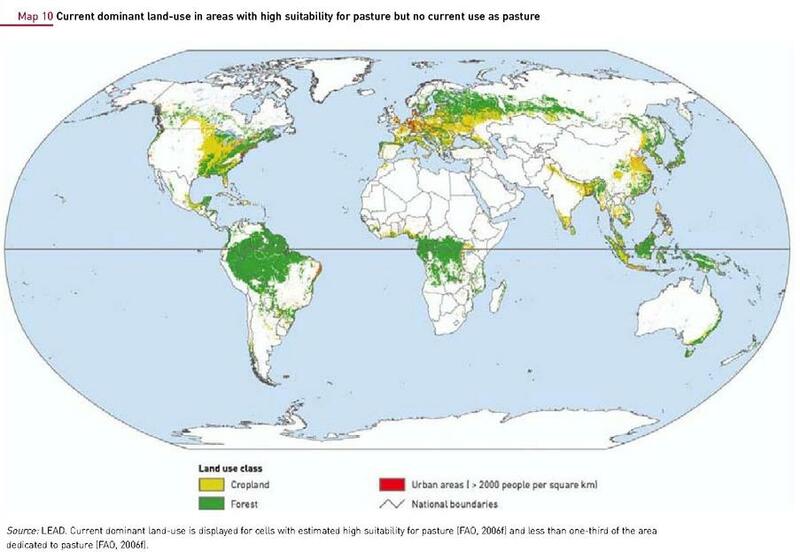 Unsurprisingly, LLS cites land use change as the leading cause of global biodiversity loss. Clear a forest for soybeans or cattle and the plants and animals of that forest will die. But of course, we reasonably put out own own need to eat above that of wildlife, but we can choose to minimise the damage. Or not. LLS describes the mechanisms whereby livestock damage land. On rangelands, we have the holy trinity of extensive livestock production with which any visitor to the Australian outback who knew what to look for would be familiar: desertification, increased woody plants, and deforestation. Queensland’s destruction of Brigalow forests during the 1990s was particularly savage. On a per-capita per-hectare basis, this deforestation surpasses anything in Brazil or Indonesia – the two acknowledged superpowers in the deforestation race. Factory farms produce different environmental problems. Any damage done during cropping for feed production should be attributed to them and not to plant food production. Water pollution can cause eutrophication, ground water contamination, red tides, blue-green algae and dead zones. Such events can have non-livestock causes, but modern livestock numbers can easily impose intolerable loads on natural systems. In the US, there is often better data available than elsewhere and LLS presents a figure of 55% as the amount of erosion on both crop land and pasture which is due to livestock either directly or via feed production. This erosion and loss of topsoil has the potential to cause a crisis in global food production that will make this year’s crisis seem insignificant. Typically, the manner of deforestation is more complete for crops than than cattle. So the obvious question is whether it preferable to clear a small area completely or to clear a much larger area, but less intensively, for grazing? This table isn’t from LLS, but from a key study into grazing systems relied upon by LLS (Asner et al, “Grazing Systems, ecosystem responses and Global Change”). It shows figures for above and below ground carbon for a tropical forest and grassland. Clearly, a grassland is a poor substitute for a tropical forest as a carbon store. In between grasslands and wet tropical forests are all manner of woodlands with values anywhere between these extremes. When a tropical forest is cleared, it isn’t only the above ground carbon which is lost, much of that below ground may be lost over coming years. Cattle grazing tropical soils compress the ground as elsewhere, but the result can end up with decomposition becoming anaerobic and the soil can become a methane source. More on this later in this series. The basic transformation of livestock production during the past 50 years has been driven by the simple fact that grasslands which are both available and suitable for grazing are already used. They are not only used, they are frequently degraded. In Australia, we don’t need global studies like LLS to tell us about either deforestation or degradation. We are world leaders in both. This map shows areas which are both highly suitable and available for grazing. I’ve shrunk the map, but the green areas are forest areas, the yellow are crop areas and the red are urban areas which are currently on land suitable for grazing. As a result, increases in meat production that have been achieved during the past half century have been due to intensification or deforestation. Jared Diamond estimated back in the late 1990s in “Guns, Germs and Steel” that gatherer/hunters need 10 to 100 times more land than farmers. Similarly, extensive livestock need more land than intensive livestock, for similar reasons. Most native grasses are, or have been thought to be, less than optimal for maximising livestock growth, so if you want maximum growth, grow the feed elsewhere (or locally) using intensive methods with plenty of water if possible, and fertiliser. Alternatively sow your pasture with grasses selected for maximum productivity and add fertiliser. Australia spent 70 years introducing 5000 species of grasses and legumes in an attempt to improve on native grasses for livestock growth. Fertilisation of non-irrigated pasture is common. In 2005, for example, non-irrigated pasture uses 39% of total nitrogenous fertiliser in New South Wales, 35% in the Northern Territory, 60% in South Australia and 44% in Victoria. Apart from intensification, the second key to the increase in meat production over the past 50 years has been increased is by shifting from biologically inefficient feed converters, large ruminants, to efficient feed converters, pigs and chickens. The third key to increased production has been a spatial shift. Cattle grazed on rangelands have to be moved to where the consumer lives, typically nowhere near the rangelands. Pigs and chickens are kept in huge sheds fairly close to cities. It is far more efficient to ship feed to factory farms than to ship live animals to abattoirs. In the next post, I’ll get down to the detail of climate change impacts of the food system in general and livestock in particular. We showed earlier that feeding the global population with plant food would release huge amounts of grazing land for other species and even some cropping land. This is an extreme in the spectrum of possible change and has a low social feasibility. But this post is only concerned with scientific feasibility. To show that this is scientifically feasible, we need to show that, contrary to popular belief, animal protein has no practical advantages over the plant proteins found in standard plant staples like, for example, wheat, beans or rice. The Australian National Health and Medical Research Council’s 2006 Nutrient Reference Values of Australia and New Zealand lists protein requirements without distinguishing plant and animal protein requirements. This is because there are no relevant differences between plant and animal protein where food intake is adequate. And when food intake isn’t adequate? What then? The weapon of choice at present in saving malnourished children is a product called Plumpy’Nut. It is basically a fortified peanut butter. Compared with traditional fortified milk based products, the peanut based formula works better (restores growth and health faster), is less prone to infection with pathogenic bacteria, is cheaper and doesn’t look like milk. The latter is an advantage because health workers have a hard time persuading mothers to breast feed when the treatment for malnutrition looks like milk (Am J Clin Nutr 2003;78:302-7). This of course is a statistical statement. Vegans and vegetarians consuming frequent meals of coke and fries will get sick just like anybody else eating too much of these foods. So how much protein does animal food currently provide? All up, despite using 33% of arable land plus a massive grazing area, animal food production only supplies 38% of the daily average of 76 grams of protein for each person on the planet. This is likely to be an overestimate because of the use of carcase figures in the data. However animal food distribution is not uniform and makes up far more of the diet of the 1.4 billion people in the developed world with animal protein being about 50% of all protein. Animal protein is about 30% of protein in the other 5.3 billion people on the planet. Extensive savanna grazing systems are not that simple. There is good evidence that Queensland savanna woodlands have undergone woodland thickening and that the level of sequestration is greater than methane emissions. The system may even be a net sink. There are other forms of tree and shrub increase besides woodland thickening – shrub invasion, scrub encroachment and regrowth after land clearing. However they are all somewhat different. Woodland thickening which also occurs in southern Africa and the southern USA is thought to be the result of a fire-mediated sub-climax savanna woodland in which fire frequency has been reduced. Put the system back in the “natural state” and you will have a lot fewer trees, and more grass (less carbon stored) and more fires – so more GHG emissions. So for many parts of Australia – the case against domestic stock may be well overstated. Especially now that broadscale clearing of remnant vegetation is banned in Queensland and NSW. I have personally struggled to find a framework whereby I can think systematically about the land use contribution to climate change. It seems to be qualitatively distinct from the aspect of fossil-fuel emissions. There you have point sources, like motor vehicles and power stations, and the only limit on their capacity to produce emissions is the limit on the ability to supply them with raw materials to burn, and the magnitude of the contribution made to climate change is directly determined by the quantity of fuel burned. Whereas the way to think about land use seems to be that a given area of land makes a fixed (not a growing) net contribution to radiative forcing, dependent on its state, and that this contribution may be discontinuously changed to another fixed value if the nature of the land use is changed. Thus, a given wilderness area will be a source, a sink, or neutral as part of the biological carbon cycle. If a jungle burns down, a net positive increment to radiative forcing results, on account of the liberated carbon. But the jungle can’t grow back and burn down again and thereby make double the contribution, because in growing back a comparable quantity of carbon had to be sequestered there again, so the original positive increment was annulled. When ruminants like cattle are brought into the picture, it becomes more complex, but the paradigm that for each land state there is a fixed net contribution still seems valid. A given surface area can support only so many animals, and so there is definitely an upper bound to the rate of methane release possible. I therefore conclude that, to a first approximation, the way to think about land use and climate change is to think of the different possible *states* of areas of land as corresponding to different fixed net forcings. When you change the state of the land, it’s as if you’re adjusting a dial labelled ‘net forcing contribution’. But there are definite bounds on how far the dial can turn in either direction, something which is not the case with respect to machine emissions, the magnitude of which is instead limited only by fuel supply. robbing peter to pay paul. There are always exceptions to rules of thumb! Do we even know whether our current savanna woodland ecosystems are net greenhouse improvements over the “original state” which would have been much more open with fewer trees. The presumption is that European pastoralists have changed the greenhouse balance to the negative – it may not be so? (or at least that simple). And savannas occupy a large part of the globe – and are also affected by highly variable rainfall – ENSO – and again likely to be affected by climate change. Increasing atmospheric CO2 may also preference woody C3 plants over C4 grasses. (controversial perhaps). had fewer trees, that would be an exception. livestock and 3 million tonnes from wildlife. I think that says it all. You may have cleared 100M hectares – but (a) clearing is inefficient – there’s a thing called “regrowth” and (b) vast areas of woodlands which were open are now much more closed. Wall to wall accounting is the issue. 85% of Queensland is grazed – most of it is not arable for cropping. What is useful for agriculture has been developed. Figure 28 doesn’t even pass the giggle test for Australia IMO. Jared Diamond is often wrong about Australian ecological issues – Fertilisation of non-irrigated pasture is common? In the NT ?? How much again? ROTFL. Tothill and Gillies would put only 20% of northern Australian grazing lands in Class C condition. You also need to do the full budget on cropping soils – vast amounts of soil carbon lost and still decreasing. http://www.publish.csiro.au/paper/SR99042.htm Emissions of NOx from nitrogenous fertilisers. Additions of superphosphate. Soil acidification. Structural decline. Highly variable ENSO production environment. Massive river diversions for irrigation schemes. Methane emissions from major dams. Nutrient loss into waterways. Cropping also has more than its share of issues. If you want to make arguments on ethical grounds of eating meat, cruelty in production systems or human health – fair enough – but the above ecological analysis in the Australian context isn’t convincing IMO. However I encourage you to try harder. Simply there are too many people on the planet to have food production systems that are not in some respects exploitative. Agriculturalists and natural resource scientists are striving hard for some sense of balance. wrong then say why — a snigger is hardly a killer argument. palm oil in Indo. So how much of that massive deforestation is down to cattle? trees for that! The horror, the horror! quantity of safe food in return. Well wouldn’t the first thing the AGO has wrong. 35% of what? And where are NT pastures being fertilised ? Love to see the data. Well, I agree with both Luke and Geoff. I find 35% pretty implausible, having lived, worked and travelled extensively in the NT. But the again there is little of any type of agriculture in the NT besides that around Darwin and the rural area (mangos etc. ), so it is possible. I’d like to see the AGO data verified or challenged – or else accepted until better data can be sourced. Barry maybe they use some N fertiliser on their far northern dairy industry, but I’d be surprised to find heaps of nitrogenous fertilisers used on northern Australian grasslands – given the economics of grazing extensive areas. The point anyway is that a full wall-to-wall carbon accounting of our grazed woodlands with a comparison to pre-European condition might be surprising. states? What about 44% in Victoria? cropping/urban/forestry). Then add emissions from 28m cattle and 80m sheep. of ~91m or woody native veg and ~9m other see Soe 2006.
any data to this effect. 2Mt (at the farm gate), which is a massive amount of food. Geoff – and you also have to account for the full clearing for the Australian wheat and dryland cropping belt from Clermont central Queensland down through NSW into Victoria, the Eyre Peninsula and SW WA. And unlike clearing for grazing it doesn’t tend to regrow native species thanks to continuous cultivation. We’d also have to put up a proportion of the eco-bill for salinisation. You also have to account of the one-off massive rundown of soil carbon as a result of clearing and cultivation. And now still declining. And most cropping DOES use nitrogenous fertiliser. I would expect to see nitrogen fertiliser used on intensive dairy pasture in Victoria, possibly irrigated. The economics of fertilising of extensive woodland or rangeland systems would be prohibitive. Indeed grass protein and energy can be so low that it is common for northern Australian production systems with Bos indicus hybrids to use urea/molasses licks to supplement animals. I don’t have any data on forest versus grassland sequestration. Proper forests would have to be much higher. But we’re not talking forests – woodlands have scattered tree – i.e tree and grassland mixtures. Fire regime often determines the balance. More fire – less trees and more grass. Less fire more trees and less grass. But Geoff let me encourage you to continue. Any criticism offered in a scholarly light. Meat and Liverstock Authority are very conscious of their greenhouse emission exposure and are actively involved in seeking ways to reduce emissions. However if one’s motivation is the ethics of meat consumption that may not be seen as helpful. ECOLOGICAL MANAGEMENT & RESTORATION VOL 8 NO 3 DECEMBER 2007. Nicw piece of work…keep it up! Climate Change Q and A Seminar 5: Friday 10 Oct – Will it cost the earth to avoid climate change?